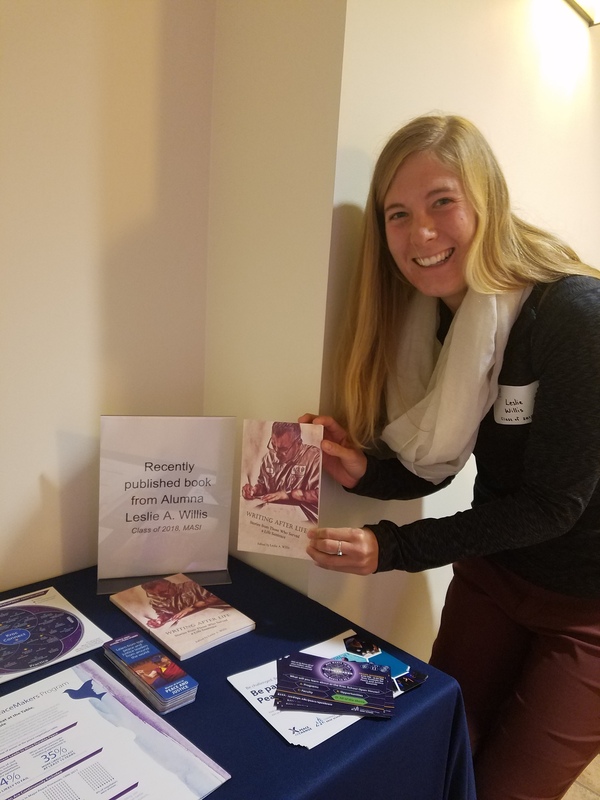 Leslie with her book at the Kroc School's homecoming brunch in 2018. From analyzing global challenges and existing solutions to examining case studies of different business models and their approach to innovation, the Kroc School’s Master of Arts in Social Innovation (MASI) program offers macro and micro perspectives into the need for socially innovative solutions on a global and local scale. Through field-based practicums, field trips to social enterprises, and bringing key practitioners into the classroom, the opportunities to apply what I was learning and engage with real-world scenarios were rife. As I reflect back to the time I was seeking graduate school programs, I knew I wanted a program that emphasized learning and experiencing beyond the classroom walls. The MASI program provides this opportunity — students are encouraged to go out into the community, listen to the people, learn with them, and work alongside them. 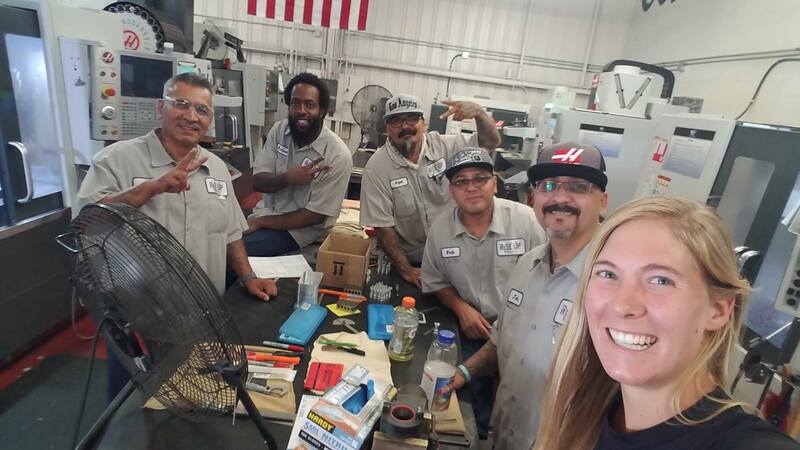 Leslie with the members of Rise Up Industries at the machine shop in Santee, CA. Early on, I began using my connections at the Kroc School to identify organizations in San Diego with which I could become involved and put the skills I was learning in MASI into practice. A fellow student introduced me to Rise Up Industries (RUI), an 18-month workforce re-entry program for formerly incarcerated individuals based on the model of Homeboy Industries in Los Angeles. Inspired by the members’ stories of transformation and moved by their determination to overcome reentry challenges, I began conversations with the staff and employees to determine where their needs were and how my skills could prove beneficial. I was utilizing the techniques explored in my core courses − impact gap analysis, systems thinking, customer journey mapping, and human-centered design − to do so. The more I listened to the testimonies of RUI’s members and conducted additional research, the more aware I became of the challenges individuals with criminal records must overcome as they re-enter society and the role that systems of support play in easing the transition. As our conversations evolved, an idea developed − an idea for a project that would benefit RUI’s members, the organization itself, and the wider community. We would conduct a storytelling project. After all, humans understand through stories. From completing our basic day-to-day tasks, like grocery shopping, to going on breathtaking adventures, humans share our experiences through narrative. Stories have the ability to connect people and to enable understanding between individuals with diverse backgrounds and viewpoints. This storytelling project would empower the members to own their voices, their experiences, and their transformations while providing a platform for them to give back to their community; enable RUI to enhance its marketing and outreach strategies to include humanizing stories of its impact; and broaden the perspectives of community members to acknowledge our common humanity and better support those who are marginalized by society. I knew that the success of a storytelling project at RUI would depend upon the investment of its members. Throughout the MASI program’s core classes, we explored the design-thinking process − Empathize, Define, Ideate, Prototype, Test − a cyclical process that offers a human-centered approach to designing innovative solutions. Employing these concepts, I began meeting weekly with four RUI members to co-create a project in which they would feel invested. More than sharing stories, this project came to include writing workshops and computer and smartphone literacy lessons as additional needs were expressed. As trust and friendships were built, we started sharing more personal stories with each other and compiling them together. After months of writing, sharing, revising, and editing, we were ready to share these stories with the community. The result? 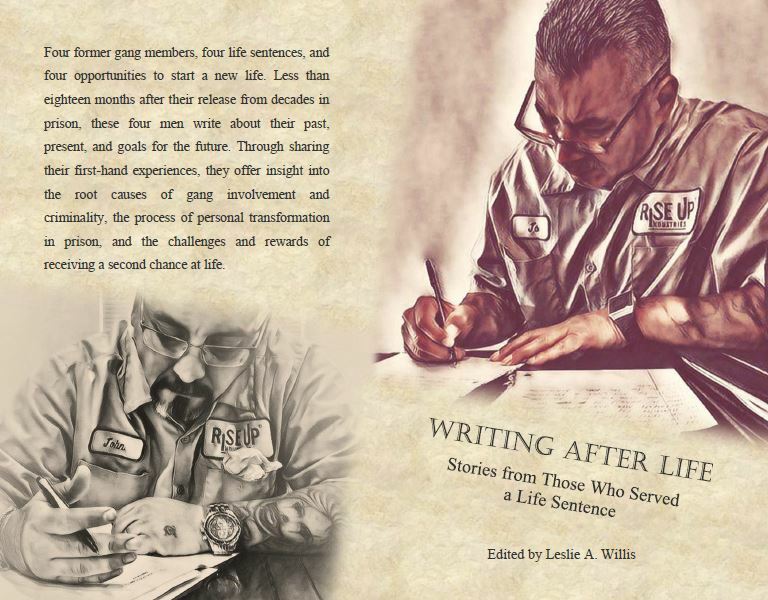 Writing After Life: Stories from Those Who Served a Life Sentence, a compilation of stories about four RUI members’ personal experiences with gangs, their transformations in prison, and the rewards and challenges that come with receiving a second chance at life. Stories of pain, fear, hope, and love; stories that bring awareness to factors that lead to incarceration and recidivism while also showing that personal transformation is possible, especially with a supportive environment. In October 2018, less than eight months after our project began, Writing After Life was debuted at RUI’s annual fundraiser. With the support of generous donors, we were able to print 500 copies to donate to key individuals and organizations working to reduce youth and adult rates of incarceration and recidivism. Our book is now entering Juvenile Hall libraries, and we are currently working to have the book approved by Donovan State Prison so that it can impact others with similar life experiences. For the wider community, the book is available for purchase on Amazon.com. 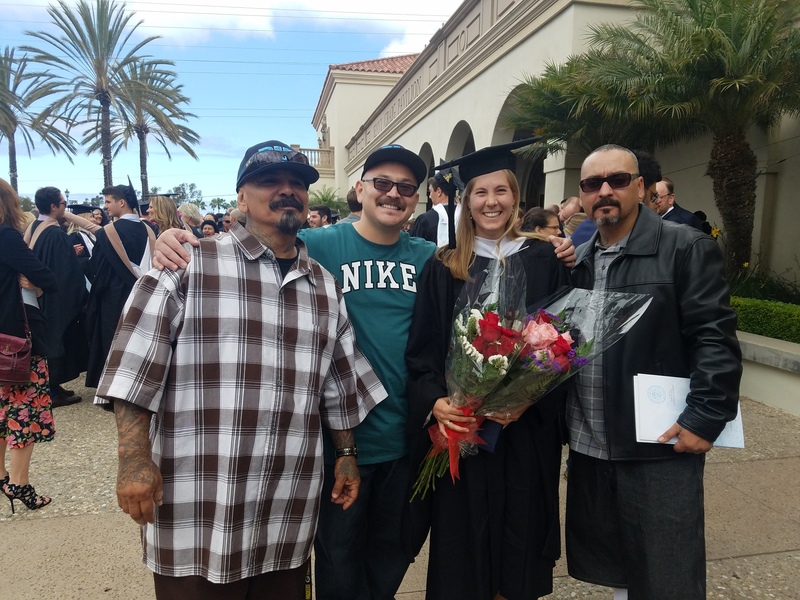 Leslie with three Rise Up Industries members at her Kroc School graduation in May 2018. The MASI program is structured for students to learn a set of tools for designing socially innovative solutions to social problems − clearly define the problem and understand the needs of the target beneficiaries, then collaboratively design a solution to meet those needs, ensuring the organizational and strategic capacity exists to do so. Thanks to my experience as a MASI student, I have been able to simultaneously apply those skills and contribute to the growth of a social enterprise that is addressing a social issue I feel very passionate about. I believe that through dialogue and sharing diversity of thought and experience, we, as individuals in a society, are able to broaden our own perspectives, acknowledge our similarities, and work to reduce the margins that divide us from each other. If we stifle those voices different from our own, we deny ourselves the opportunity to learn from and with each other. My experience at the Kroc School taught me to listen on a deeper level, to seek to truly understand and relish in our common humanity, and it gave me the tools to create a space for all voices to be heard and acknowledged. Whether you’ve spent 10 years working with startups, 20 years in the business world, or just graduated with your Bachelor’s degree, the MASI program will challenge your way of thinking and doing so that you can more thoroughly examine the root causes of a social problem and design more efficient, effective, and just solutions. With this knowledge, the world can become a more just and equitable place for everyone. Ready to advance your jouney as a social innovator? Learn more about the Kroc School's Master of Arts in Social Innovation. begin quoteMy experience at the Kroc School taught me to listen on a deeper level, to seek to truly understand and relish in our common humanity, and it gave me the tools to create a space for all voices to be heard and acknowledged.